The prayer of Jonah. (1-9) He is delivered from the fish. (10)1-9 Observe when Jonah prayed. When he was in trouble, under the tokens of God's displeasure against him for sin: when we are in affliction we must pray. Being kept alive by miracle, he prayed. A sense of God's good-will to us, notwithstanding our offences, opens the lips in prayer, which were closed with the dread of wrath. Also, where he prayed; in the belly of the fish. No place is amiss for prayer. Men may shut us from communion with one another, but not from communion with God. To whom he prayed; to the Lord his God. This encourages even backsliders to return. What his prayer was. This seems to relate his experience and reflections, then and afterwards, rather than to be the form or substance of his prayer. Jonah reflects on the earnestness of his prayer, and God's readiness to hear and answer. If we would get good by our troubles, we must notice the hand of God in them. He had wickedly fled from the presence of the Lord, who might justly take his Holy Spirit from him, never to visit him more. Those only are miserable, whom God will no longer own and favour. But though he was perplexed, yet not in despair. Jonah reflects on the favour of God to him, when he sought to God, and trusted in him in his distress. He warns others, and tells them to keep close to God. Those who forsake their own duty, forsake their own mercy; those who run away from the work of their place and day, run away from the comfort of it. As far as a believer copies those who observe lying vanities, he forsakes his own mercy, and lives below his privileges. But Jonah's experience encourages others, in all ages, to trust in God, as the God of salvation. 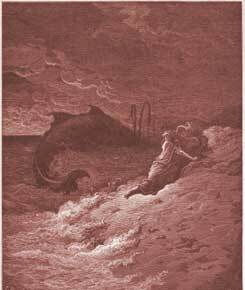 10 Jonah's deliverance may be considered as an instance of God's power over all the creatures. As an instance of God's mercy to a poor penitent, who in distress prays to him: and as a type and figure of Christ's resurrection. Amidst all our varying experiences, and the changing scenes of life; we should look by faith, fixedly, upon our once suffering and dying, but now risen and ascended Redeemer. Let us confess our sins, consider Christ's resurrection as an earnest of our own, and thankfully receive every temporal and spiritual deliverance, as the pledge of our eternal redemption. He was dead and in hell and God brought him back to life and redeemed him. As I read this I had to realize that all my life I was told that Jonah was swallowed by a whale . But,now as I read this it says "Jonah was swallowed by a great fish" it nevers said he was swallowed by a whale. GOD had to get Jonah attention again and it was not hard for GOD to it. In 2018 GOD is still having to (2nd time) get the attention of those who HE has give a specific task to perform. WOW! WOW! WOW! I believe that Psalm 130 represents Jonah's prayer in the belly of this fish. Jonah repented from inside the fish, and was then vomited out. Whatever he was before he was thrown into the sea; he wasn't anymore! Jonah's calling and anointing came again, and his word was with power! I love the story of Jonah! What a great and bold Prophet! He went to the Capital heathen city and the most terrible people in the world; and the Word of God pronouncing their doom broke them! After Jonah was spit out on dry land after being in the belly of the whale, he might have referred to himself as a really "STINKING PREACHER" that really needed for the Lord to clean him up on the inside as well as the outside so he could be used as a vessel of honor for His honor and glory. Verse 9: Jonah was determined to pay his vow no matter how difficult it would be for him. What Do You Think of Jonah 2? What was Jonah referring to when he said, 'They that observe lying vanities forsake their own mercy'?